Nisyros is a quiet little greek island in the Aegeian Sea. It is about 20 km south of Kos and only to reach by boat. The next airports are on Kos and Rhodos. Because of that, it isn't as developed for tourism as the bigger islands are. Those who look for relaxation with distance to the tourism centres will benefit of it. 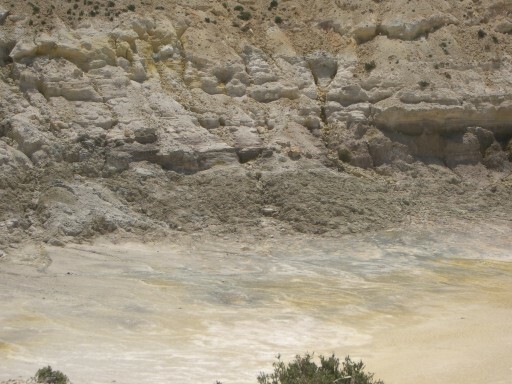 In the centre of the Island of Nisyros there is, beside some more little, a big volcanic crater of about 300 m diameter. The volcano under the island is still active which is shown by fumaroles and holes with boiling mud in the craters region, hot springs and frequently local earth quakes. The lava-soil makes Nisyros very fertile. Therefore in former centuries the whole island was developed for agriculture and made accessible with a network of paved paths, which partly is preserved to the present time. These old paths, usually paved donkey-paths, can be used for walking today. Off the roads and villages the wanderer will enjoy a wonderful nature, peace and quiet, the smell of the sweet herbs and a fascinating landscape. People who are interested in archaeology can look for the ancient buildings precision at the much more than 2000 years old Paleo-Castro. Because we didn't find any useable walking map, we recorded our walkings in 1996 with a GPS-receiver and made a walking map out of these data. In following holidays we added new walking-data to the map. This we did as a hobby-project. The copyright of this walking map is eclusive by Beate and Dr. Juergen Franke. The walking map is free of charge. While you don't take money for it, you are allowed to copy the walking map onto your PC, to transmit it in original version (e.g. with e-mail or copy on electronic media) and to print it out (only complete including legend of map and imprint). You are allowed to distibute prints and to integrate the walking map in your own publications with reference - if you give them free of charge. If you want to use the map in an own commercial product (e.g. a book), you need our permission. In this case please send an e-mail to us. The walking map is a graphic in the GIF-data format, about 500 kB size. If you click to the link, perhaps it takes some time for loading the map. .
with request to publish it. Headline: "Hidden Danger in the Volcano of Nisyros"
In the NISURIAKA NEA at the beginning of July the report was published in greek in the issue MaioV - IounioV 2004 on page 5 with the same english headline. If it was published in H FONI THS NISUROU we don't know.